I am a native St. Louisian & Structural Design Engineer with an aerospace company. An endurance athlete at heart, I love to actively participate in any run distance from 100 meters to 26.2 miles, and any Swim-Bike-Run distance from Super Sprint to 70.3. The Duchek Family works to participate in or volunteer for our local multi-sport events. My supportive wife, Jennifer, has braved the cold or tolerated the heat for many of my early races, and she joins in for 5K or shorter running events. Adam (“AT”) is our eldest son, age 14, and has completed more than 30 – 5Ks, 12 Kids Tris, 18 Rec Plex Indoor Tris, a Sprint Tri & runs Cross Country. Younger son, Devin (“The Devinator”), is 12 years old and has completed over 30 – 5Ks, 5 Kids Tris, 4 Rec Plex Indoor Tris & also runs Cross Country. Sheba (“good for nothin’ dog) is our 65-lb Yellow Lab/German Shepard Mix and has finished the Macklind Mile / Dog Mile 4 straight years! Any hobbies outside of triathlon? For kicks (and punches), I am a 3rd Degree Black Belt Taekwondo Instructor and Referee/Judge. Jennifer teaches Zumba. Adam is a Boy Scout, wrestler, soccer player and baseball player. Devin enjoys Scouts, wrestling, soccer and baseball also. Sheba sleeps & likes belly rubs. What led you to triathlon? While on a 6-month work assignment in the State of Washington leaving Jennifer and the boys in St. Louis, I was looking for a way to stay out of trouble while I was living on my own. Mountain hiking (not mountain biking) with my work teammates was one productive activity I enjoyed, but I was also encouraged by my company and a few work teammates to train for and run a half marathon. In 2011, I ran my first 13.1. The next year, I started training with Big River’s Training Teams and getting to know several runners who were also triathletes. By 2014, I was looking for “more”, remembered a local article about JP Palmer that mentioned SLTC, and joined the club that February. That July, I completed the Ballwin Triathlon. 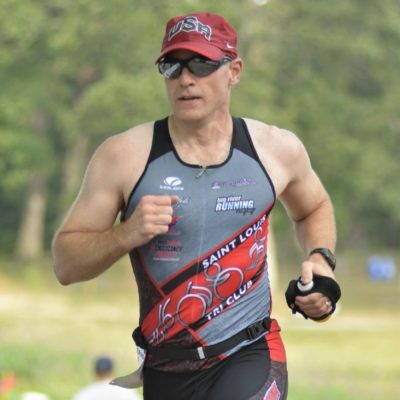 What is your favorite part of being a member of St. Louis Tri Club? Building friendships and enjoying camaraderie through training, races & social time is definitely my (and my family’s) favorite part of being members of this awesome club! Our fellow members are our support and inspiration. We really appreciate that and hope we can also support and inspire.